WhatsApp has now become de-facto instant mobile messaging platform, especially for Smartphone users in India. There is a reason for that – literally every smartphone user has WhatsApp installed on their phones. According to recent estimates, WhatsApp has over 65 million monthly active users in India. In comparison, there are approximately 120M+ total smartphone users. With that kind of coverage, WhatsApp has become an attractive proposition for businesses. Although WhatsApp does not have any developer API’s and has a closed platform, businesses across the world are looking at how to market their products & services on WhatsApp. MySmartPrice, one of leading product price comparison platform has created a service that is harnessing the power of WhatsApp. They have now started offering product pricing on WhatsApp. And from the tests we have done it really works quite well. With the new MySmartPrice offering, users need to just message the name of the product on WhatsApp and it will instantly return with the best pricing available for that product with link that will offer more details. MySmartPrice, already being a price comparison platform has data of which ecommerce store is offering the best price on a particular product, hence from a user perspective they are just a message away from getting the best prices. Here are the screenshots of couple of tests that we did to test this new service. 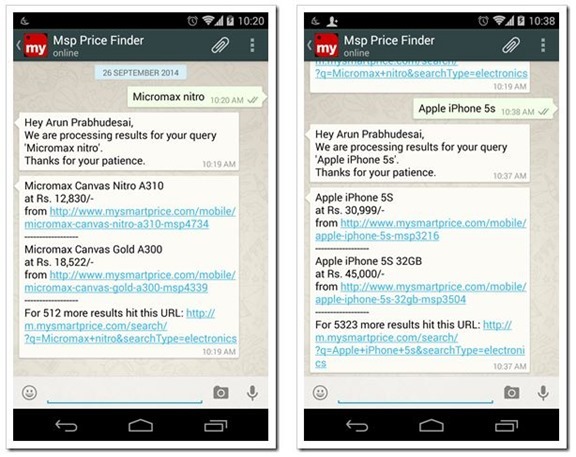 How to Use MySmartPrice WhatsApp Service? It’s quite simple – Just add this number – 9332222222 – to your contact list and then send the name of the product for which you need to find the price. I searched for “Canvas Nitro” and “Apple iPhone 5S” and in both cases I immediately got the price and the link where more details were available. Interestingly, the app send me a personalized message with my name, which was quite surprising. I think MSP needs to remove that. It unnecessarily may create doubts in minds of users about their privacy being compromised. Another aspect that we would have liked to see is the name of the ecommerce site that is offering the price. Currently, MSP just offers a link to their product page from which users can get more details. We do understand that some users may prefer directly going to eCommerce site (MSP may lose their commissions in that case) once they get the name, but for most, it will be an important information they will want to know. In today’s world, with advent of eCommerce, India has turned from being a seller’s economy to becoming a buyer’s economy. Sellers will come to you rather than the other way around. That’s exactly what MySmartPrice has done. Now you can know best price of any product just by typing the product name on your favorite messaging platform. Give it a try and let us know how you find this new service from MySmartPrice. Are you using official WhatsApp API ? If not how secured is your un official whatsapp api code. When you possible to take my whatsapp user name , I believe it may possible to take all my whatapp status , profile pics and even my contact or group details , its fully concern about security and personal . You are going to be in Trouble !. I would like to tell you that all your personal details which are accessible from the Whatsapp Official Application are the only details which this unofficial whatsAPI could fetch. Your current whatsapp status?, yes!. Your all previous statuses? No!. Your future statuses?, Well if the guy is that much interested then he could probably track those with the official app itself. Same goes for profile pictures and No!, it can not possibly get any of your contacts or group details. When i tried this, i got a message. This service has been disabled for the time being. MySmartPrice – whatsapp app working or not? MySmartPrice app sent me an irrelevant response for the Diesel Watch Mr. Daddy 2.0 search. Gives me seh response as Canvas Gold A300 and Samsung Galaxy Star Advance. I wont recommend this app for anyone. @Arun, Regarding the personalized message, we are using the name which the users have provided as public information to whatsapp to personalize the message. Not sure if it posses any privacy issues. Hmmm… I understand. But from novices perspective, they are not giving it to you, so some might be surprised seeing message with their full name. That’s all what I wanted to point out. Even I was surprised, who understands how and where you have picked up the name from. Personalized messages are not scary. It adds that human element to the conversation. While I agree users haven’t been “asked” the name. Us using it is a way of making them feel comfortable. Good article, please check link for http://www.mysmartprice.com, one alphabet is missing. Thanks for letting us know. corrected it now. Works like a charm! thanks for the info! I agree and thats what I have said. But even with the ecommerce site name, majority of them will still go to MSP site as link is available. But it will be a good practice to have it. Some people just want to know rather than buying the product. It will bring in more appeal to users.